As a dietary supplement, mix 1 scoop with 6-12 oz of cold water and consume 30-45 minutes before training. It is recommended to take with food, but for best results take on an empty stomach. DO NOT EXCEED MORE THAN ONE (1) DOSE PER DAY. Before using product, seek advice from a health care practitioner if you are unaware of your current health condition or have any pre-existing medical condition (including but not limited to): if you are pregnant or breastfeeding, in case of hypertension, if you are taking lithium, if you are taking medicine to treat cardiovascular disease, taking medicine to treat erectile dysfunction and/or taking anticoagulants, if you suffer from or have a family history of cardiovascular disease and wish to increase your level of physical activity and if you suffer from renal disease or if you follow a protein restrictive diet. Consult a health care practitioner if your cardiovascular state deteriorates. It is not recommended to consume this product with any other natural health products such as caffeine, synephrine, octopamine, ephedra or medicine which increases blood pressure. This product is not designed as a stimulant to replace sleep. DO NOT USE IF YOU HAVE SUFFERED A HEART ATTACK OR MYOCARDIAL INFARCTION. KNOWN ADVERSE REACTIONS: It has been demonstrated that caffeine can reduce blood circulation during the exercise, leading to possible cardiovascular complications such as chest pains and irregular heart beat in otherwise healthy individuals. If these symptoms present themselves, discontinue use and consult a health care practitioner. Those that are sensitive to beta-alanine, caffeine or niacin may experience hyper-sensitivity or allergic reaction, should that occur discontinue use immediately. BETA-ALANINE AND NIACIN MAY CAUSE A HARMLESS, TEMPORARY TINGLING OR FLUSHING SENSATION. In individuals sensitive to these ingredients may experience hot flashes, itch and/or tingling. In that case reduce dosage. Individuals sensitive to stimulants may also experience gastro intestinal issues (such as diarrhea). DO NOT USE IF SAFETY SEAL IS BROKEN OR MISSING. It’s time to dial-in unparalleled intensity levels and get ready rock the weights like never before. 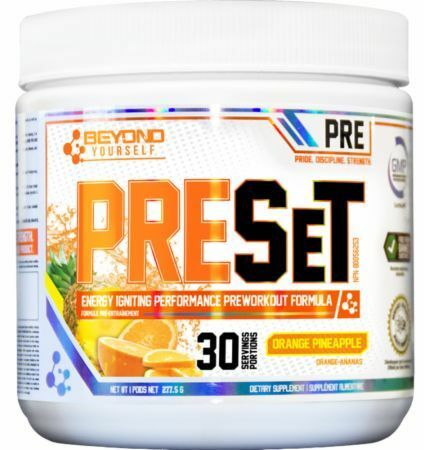 PreSET is the next generation in energy igniting performance products. Dosed with clinically proven, effective doses of everything you need to enhance your workout. Increased energy, focus, blood flow and endurance means you can go harder and heavier for incredible results. * It’s time to go BEYOND YOURSELF!